Chris Rojahn, Director Emeritus for the Applied Technology Council (ATC), will be honored as the 2017 Alfred E. Alquist Special Recognition Medal winner at the 2017 EERI Annual Meeting in Portland, Oregon on March 9. The Alquist Medal is awarded to an individual, company, or organization that has made substantial contributions to the field of seismic safety and earthquake risk reduction, having directly affected the seismic safety of the general population. The Alquist Medal recognizes career contributions or notable and/or singular achievements: a significant contribution to the public good is the primary selection criterion. ATC is proud to say that Mr. Rojahn led the company for 34 years as its Executive Director until his recent retirement. Since joining ATC in 1981, Mr. Rojahn served as Principal Investigator/Project Manager/Senior Advisor on more than 50 major projects involving earthquake and natural hazard mitigation issues. Mr. Rojahn is also committed to the application of the science and safety of the people and has become true voice of the profession, testifing before the U. S. Congress and advising the White House Office of Science Technology Policy on issues relating to earthquake hazard mitigation. As part of a long-range transition plan, the Applied Technology Council (ATC) announces a series of personnel moves to transition the organization into its next generation of leadership. After more than 30 years of service to the organization and the profession, Chris Rojahn is stepping down as Executive Director. In the near-term, Chris will continue on as Director Emeritus, providing ongoing assistance in the transfer of operational activities. The ATC Board of Directors and staff wish to express their sincere appreciation to Chris for his years of leadership and service to the structural engineering community. In his place, Jon A. Heintz will step into the role of Executive Director. Jon came to ATC after more than 15 years in structural engineering practice, and has been leading ATC’s technical development activities as Director of Projects for the past 10 years. With more than 25 years of combined experience in engineering practice and research, codes and standards development, performance-based design and assessment, and post-disaster response and investigation activities, Jon is well-positioned to continue ATC’s leadership role in identifying and implementing structural engineering practice and multi-hazard mitigation research needs at the national level. In January 2015, Scott D. Schiff joined ATC as Director of Projects after more than 25 years as a professor and researcher in structural, seismic, and wind engineering at Clemson University. As one of the founding faculty members that established Clemson's Wind and Structural Engineering Research (WiSER) Facility to address the vulnerabilities of building infrastructure in hurricane prone regions of the United States, Scott will focus on increasing synergy between ATC and the wind engineering community. With seismic, wind, and general structural engineering expertise, Scott will assist in the technical management of projects across all hazard areas. In May 2015, Ayse Hortascu was promoted to the position of Director of Projects. Ayse came to ATC in 2008, after more than six years in seismic risk engineering practice. For the past seven years, Ayse has been leading ATC projects, first as Research Applications Manager, and most recently as Associate Director of Projects. Named as an EERI Housner Fellow in 2014, and founder of Women in Structural Engineering (WISE) in the S.F. Bay Area, Ayse is a rising leader in the professional engineering community. In October 2014, Veronica Cedillos joined ATC as Associate Director of Projects. A structural engineer by training, Veronica has an international hazard mitigation expertise and interest, with over six years of experience managing and executing earthquake and tsunami risk mitigation projects throughout the world. Her projects have included work in Haiti, Peru, and Indonesia, and she has collaborated with multi-disciplinary groups from Japan, Singapore, Germany, India, and the United States. In recognition of her work, Veronica was selected as the 2010 ASCE national representative for “New Faces of Engineering,” was the 2011 recipient of the EERI Shah Family Innovation Prize. In September 2014, Anna Olsen joined ATC as Research Applications Manager. With an M.S. and Ph.D. in Civil Engineering from the California Institute of Technology, Anna has an expertise in the description, quantification, propagation, and reporting of uncertainty in hazard and risk analyses. For the past six years, Anna has worked on projects in the areas of natural hazard and risk assessment with an emphasis in earthquake engineering. She has studied the seismic behavior of steel moment-resisting frames, researched the socio-economic phenomenon known as demand surge that occurs after large-scale natural disasters, and studied the communication of hazard-analysis results to technical and non-technical audiences. In May 2015, Bernadette Hadnagy was promoted to the position of Finance and Operations Manager. This promotion is in recognition of over 20 years of service and wide-ranging skills in the areas of office operations, financial operations, Board operations support, project support, report production, and event planning. Bernie will be a key individual at the operational and financial levels of the organization, and will continue to assist in maintaining ATC’s fiscal and operational excellence. document, preserve, and disseminate valuable data pertaining to affected engineered structures with properties similar to those of structures in the U.S.
develop a framework that can be used to document key information about the structural response of building structures to future earthquakes. The data repository will also serve as a prototype for NIST’s recently initiated multi-year project to create a digital archive of data related to natural and man-made disasters as well as failure studies. This initiative promises to significantly improve the ways in which engineers help communities to prepare against disasters and structural failures. The availability of systematically organized field data would enable better procedures to vet design and evaluation tools, providing structural performance data with less stringent limitations about scale and applicability than data obtained through experimental and numerical simulations. The NEHRP JV asks that you consider contributing information to the data repository for the 2010 Maule Earthquake. All information provided shall be credited appropriately. We are interested in photographs, drawings, or sketches of buildings, building coordinates, information on soils at building sites, information on ground motion, annotations on damage level, as well as other information that may benefit our effort. The profession would gain much from your contribution. Photo showing damage to a fairly new school building in Alabama. The school had 3 separate wings and a central area. This shot is looking at a wing that collapsed (part of the central area is in the background -- it too collapsed). To the left is one of the wings that did not appear to have structural damage. However, a section of the corridor wall partially collapsed. Photo courtesy of the FEMA Mitigation Assessment Team. 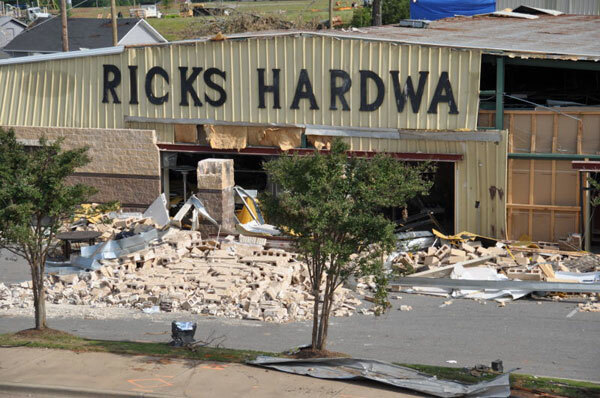 Photo showing furniture store with broken windows, shingle loss, and a nearly collapsed brick veneer in Alabama. Photo courtesy of the FEMA Mitigation Assessment Team. 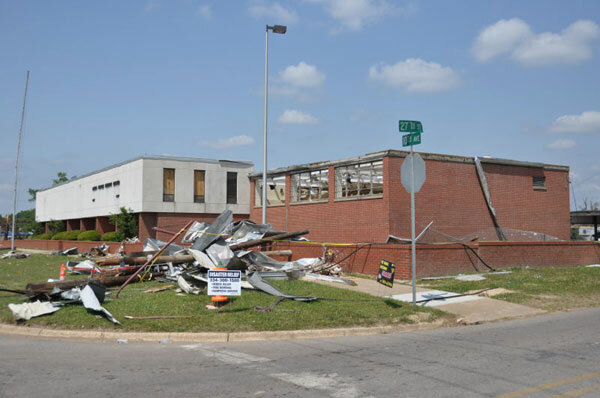 Photo showing hardware store with collapsed CMU veneer and metal wall panels in Alabama. The pre-engineered frame and purlins did not appear to have structural damage. Photo courtesy of the FEMA Mitigation Assessment Team. Photo showing damaged military recruitment center in Alabama. 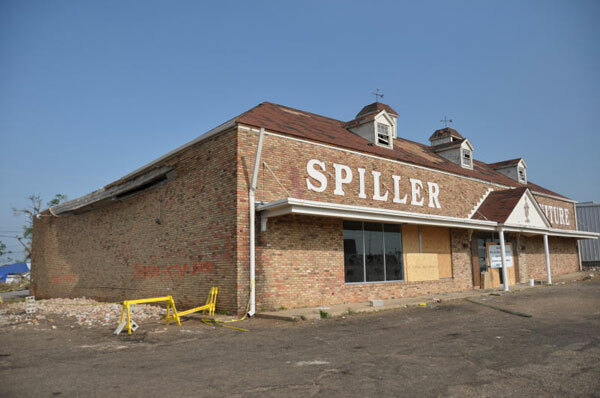 The wing with the brick veneer lost most of the roof deck. The other wing had glazing damage, but no apparent structural damage. Photo courtesy of the FEMA Mitigation Assessment Team. 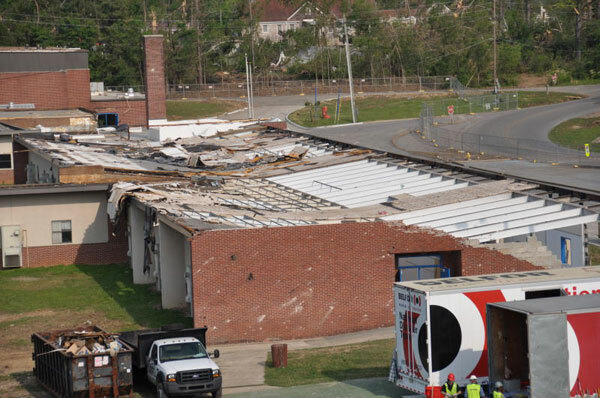 Photo showing a damaged wing a very large middle school in Georgia. This wing lost most of its roof deck. One gym lost some deck panels, but a second gym had no apparent structural damage. Some other wings had glazing damage and/or some roof covering or deck damage, while other wings had no apparent damage. Photo courtesy of the FEMA Mitigation Assessment Team. Bill Coulbourne, ATC Director of Wind and Flood Hazard Mitigation, deployed to Tuscaloosa, AL with a team sponsored by the National Science Foundation (NSF) and led by Dr. David Prevatt of the University of Florida. 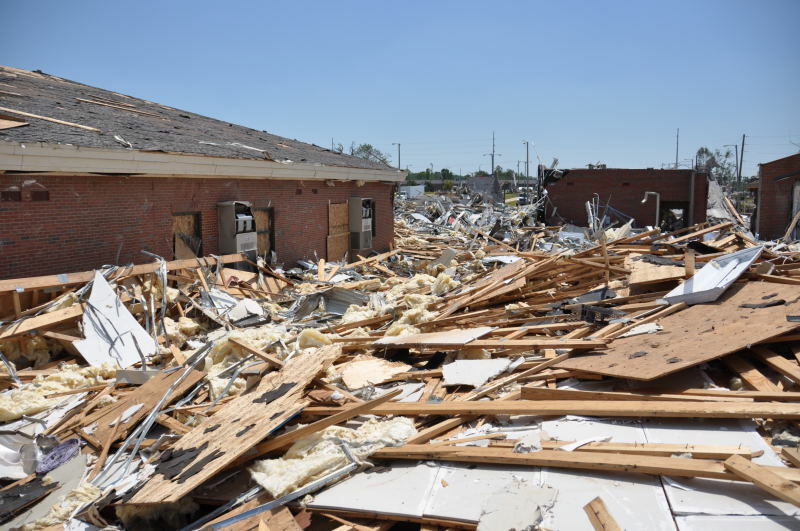 Dr. Prevatt and the other university researchers focused on the performance of wood frame buildings with the expectation to discover ways to improve wood frame buildings when impacted by tornadoes with lower wind speeds (EF0 to EF3). The team was able to investigate the failure mechanisms of approximately 150 buildings along a 6 mile long track of the tornado. The information collected will be used to determine how the building structures might be improved to allow people to stay alive in their homes during a tornadic event. The picture below shows an apartment complex damaged with what the team believes was a tornado strengthened to an EF5 category (the most severe with wind speeds at or above 200 mph). There were several fatalities reported here. The buildings were built in 2010. This site is expected to be studied in order to learn how to build buildings that survive tornadoes weaker than EF5. The next picture shows a residential structure damaged by tornado wind speeds equivalent to an EF4. A couple and their dog survived this severe damage by huddling in the center of the house. When the storm passed, several walls collapsed on top of them seemingly saving all three of them from severe injury as the rest of the house was demolished. While there was a below-grade cellar just behind the house, the occupants never had the chance to get into the cellar for more protection.